On a day when it is a bit cloudy, I always know that Michael Sherlock will bring sunshine into my life. She is a fun interview! Tell Me More: How to Ask the Right Questions and Get the Most Out of Your Employees is a leadership book designed to help leaders of all levels to embrace a simple system of Listen, Learn and Lead. Unlike academic how-to business books, Tell Me More is written in story format, taking readers on an adventure in which serious business issues are explored in fun, relatable and memorable ways. The story is told through the eyes of fictional character Maria Sanchez, CEO of a large vision care and eyeglass company. Introduced to the Listen, Learn and Lead strategy, she uses this framework to help her company and employees move through a company restructure. It’s not easy to change the way you think, act and react, unless or until you are willing to change your vision or your philosophy about what truly works when collaborating with colleagues. The concepts outlined and demonstrated — through relatable stories and entertaining dialogue in this 2nd Edition of Michael Sherlock’s Tell Me More are simple, yet poignant. Readers will learn to embrace active listening, using the information gleaned while listening to dissect (or unpack ) an issue. Armed with that information, they can then use the strategy further to facilitate solutions that empower their employees. Leaders of all backgrounds and in all industries will find Tell Me More s characters and challenges to be timeless, and will discover that the communications and leadership strategies can be employed immediately, to reap significant results. Join Maria and her team on a journey that proves that if you ask the right questions, you can truly get the most out of your employees. Revised and expanded. With a foreword by Colonel (Retired) Rob Campbell, author of It’s Personal, Not Personnel: Leadership Lessons for the Battlefield and the Board Room. 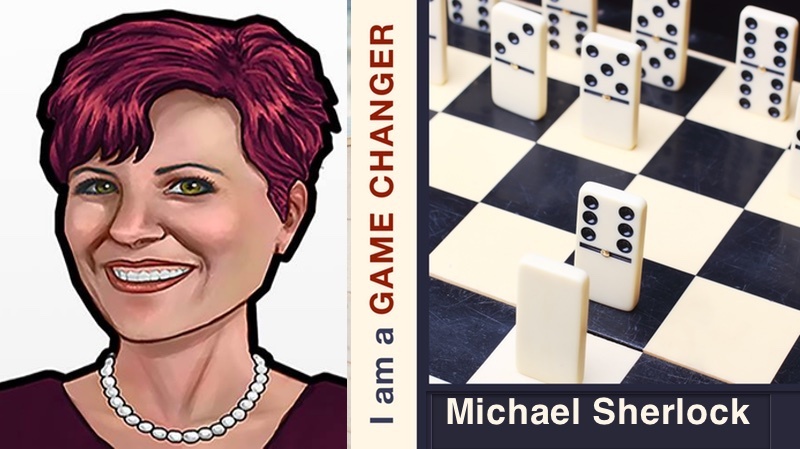 Michael Sherlock is a speaker, executive leader, sales trainer and author known for her expertise in leadership, sales and the customer experience. Throughout her career, she has been successful in dealing with serious business issues by crafting them in a way that is fun, relatable, and memorable. Michael describes what she does as Serious Business Training with Flair. Michael has more than 25 years of experience delivering motivational speeches and training sessions to audiences worldwide. She has a unique range of experience, from her beginnings as a Catholic school teacher to managing hundreds of people and hundreds of millions of dollars. As a Vice President of US Sales for two global medical device companies, Michael managed net revenue exceeding $50 million annually and managed as many as 500 employees. She has built teams, hired, trained and developed both leaders and front-line sales professionals, and navigated two large companies through vast structural and operational change. Michael Sherlock has created and executed business transformation initiatives across hundreds of businesses, built leadership development programs for numerous C-Level executives, and helped companies generate significant additional annual revenue. She set the platform for businesses to thrive both culturally and financially, through advanced leadership and vision. In 2016, Michael published Tell Me More, in its 1st edition, to share her leadership mantra. The Listen, Learn and Lead concept sounds simple, and it is. But is not easy. It is not easy to change the way you think, act and react, unless or until you are willing to change your vision. Whether Michael is speaking to thousands in an annual meeting, or working with a small team, she can help them do this. Today Michael leads Sherlock Enterprises, LLC, her Philadelphia-based training organization. She and her team provide corporations and business leaders with engaging presentations and actionable strategies on leadership, employee development, customer experience, and sales transformation. Michael shares my expertise through stories of success as well as epic failures. Michael holds a BA in Education from Eastern Washington University, and has delivered key presentations at annual conferences both within the US and internationally. Outside of her professional life, Michael is an avid urban gardener, a passionate home chef and a struggling student of the art of mediation. She enjoys traveling to countries around the world, and constantly looks forward to immersing herself in new experiences, languages, and cultures. Tell Me More, now in its 2nd edition, is the first book in The Shock Your Potential Series.